It has been way too long since I last blogged! I've been very busy at work (I'm working with endangered turtles and snakes) and not much has interested me in the beauty world in the last little while. Until now! These Kat Von D Studded Kiss Lipsticks with supposed 10 hour wear have got me perking up out of my beauty "meh" stage. So because I wasn't able to find many swatches online I went to my local Sephora and swatched all the testers that were available! This collection is 30 shades and supposed to be very pigmented and very long lasting. Most of the shades are matte but there are some glitter/shimmer/metallic shades too. 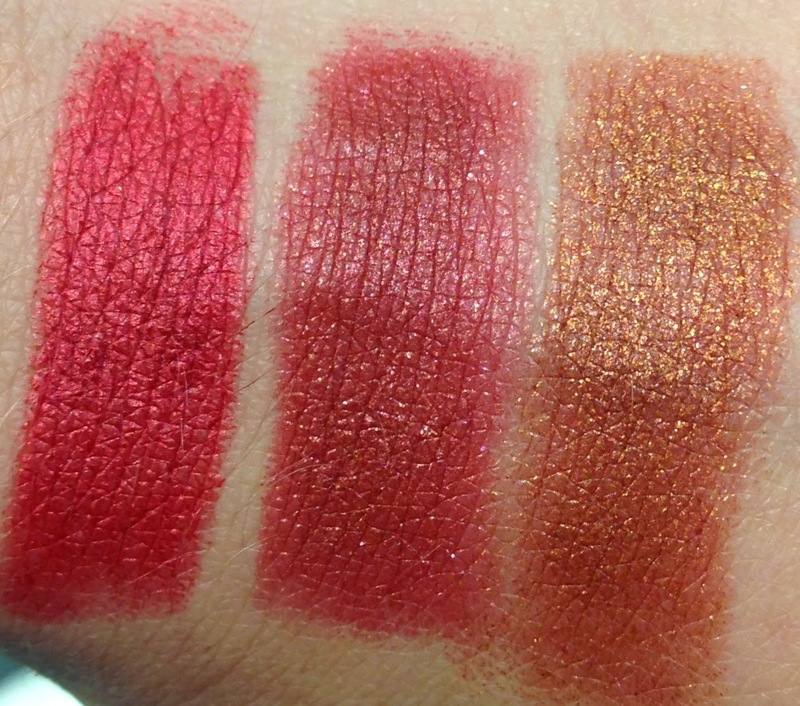 The shades missing from the swatches are Sexer, Underage Red and Backstage Bambi as there weren't any testers available for them. From what I felt when applying the shades that contained sheen, metallic finish or glitter were much easier to apply than the straight matte shades and certain matte shades were easier to apply than others- Agatha for example pulled like crazy and needed multiple swipes to lay right (even just on my arm). Wonderchilde is lovely and intense but needed multiple layers to build-up to mostly opaque- this I found was the only partly sheer colour in the line. Because of the matte texture and long wear-time of these you'll want to prepare your lips before wearing these either with a lip primer or by exfoliating your lips before use etc. I myself was debating what shade to get as there are so many unique as well as wearable shades. Though I am eyeing up Wolvesmouth for next time the three I was stuck between were Adora, Thin Lizzy and Gothica. I was worried that Gothica might be too brown but on the lips it takes on this rosy tone and makes for a gorgeous autumn inspired shade. You can't feel the glitter/shimmer in these at all either which is nice. In store I tried on both Thin Lizzy and Gothica and as I was only allowing myself to get one I eventually decided on Gothica. Surprisingly wearable and so pretty. Here's a quick lipswatch. Also I quite like the studded plastic packaging so I've got a photo of that too. Neat right? I'll save further pictures on the packaging for my review of Gothica but I wanted to give everyone an idea. 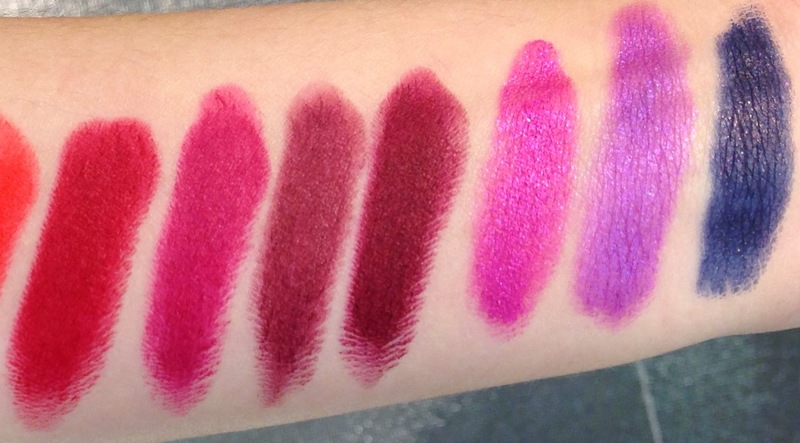 Hopefully these swatches will help you out if your torn between shades and can't see them in store. 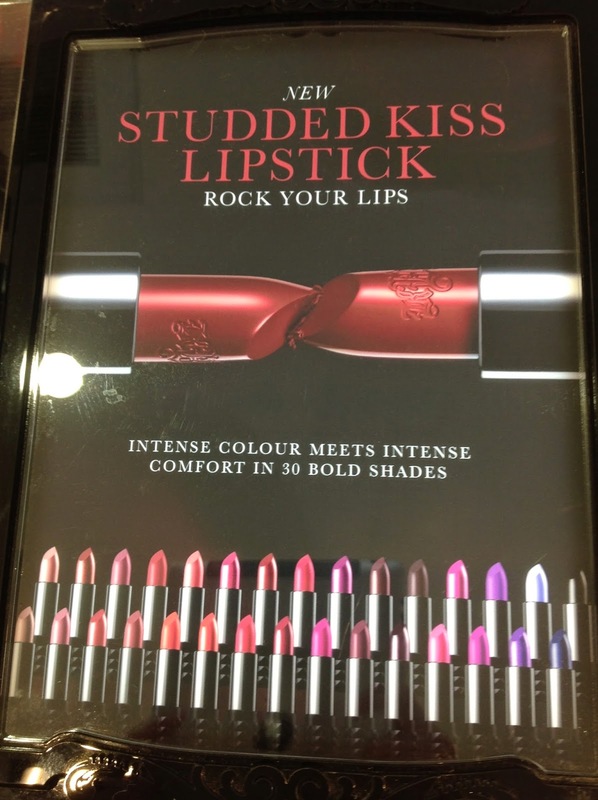 Do you have any of the Studded Kiss Lipsticks? Any shades really calling your name?